IMPORTANT: This software is only for use with the products identified and sold in Middle East & Africa, South Africa, Thailand or India. Not all models are sold in all countries. This software improves the stability of On Timer features. The software version number will be displayed on the 3rd row. If your software version is 3.010 or higher, your TV does not need this update. WARNING!! Please follow the update instructions carefully. Failure to follow the instruction may interrupt the update process and may cause the TV set to be unresponsive or may require service. WARNING!! Do not power off the TV or disconnect it from the AC power outlet. Loss of power during the installation of the firmware update may cause the TV set to be unresponsive or may require service. If your television’s software version is 3.010 or higher, your TV does not need this update. Download the sony_fw_2012_3010_paa_siegfried.pkg file to your computer. Go to the directory where the file was downloaded and verify that the size of the sony_fw_2012_3010_paa_siegfried.pkg file is 32,092,895 bytes. Right-click the sony_fw_2012_3010_paa_siegfried.pkg file, and click Properties. Check General tab on the Properties window, verify that the "Size:" listed is "34.59 MB (32,092,895 bytes)". If the file size is different than the "32,092,895 bytes", please delete the downloaded file, clear your internet browser cache and download the sony_fw_2012_3010_paa_siegfried.pkg file again. For Windows® operating system: Go to the directory where the file was stored, right-click the sony_fw_2012_3010_paa_siegfried.pkg file and, from the menu, click "Send To...", and then click the drive (E.g. Removable Disk E:) that represents your USB device. The file will be copied onto your USB device. For Macintosh® OS X operating system: Drag and drop the sony_fw_2012_3010_paa_siegfried.pkg file to the root folder of the USB device. Note: The software update takes approximately 3 minutes to complete. First read the whole procedure before starting to update the firmware of your TV set. Please do not remove the USB storage device until the update is complete. Insert the USB storage device containing sony_fw_2012_3010_paa_siegfried.pkg file into the USB port located on the side of the TV. Once the TV detects the firmware, it will automatically run the firmware update. During firmware update, the PIC OFF/TIMER indicator is flashing as amber, and the STANDBY indicator on with red. TV screen will be blank during firmware update. After several minutes, the firmware update will be completed and TV will reboot automatically and POWER indicator is on with green. Navigate to the Settings category and press OK to select it. The software version number will be displayed on the 3rd row. 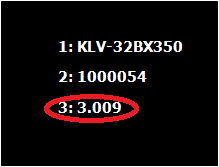 If your software version is 3.010, your TV has been correctly updated. The firmware update process does not start after insert the USB device and AC Off & On TV, or the PIC OFF/TIMER indicator is flashing as amber, Standby indicator on with Red and Power indicator with Green.